Happy Halloween! At Old Friends’ “Kentucky Derby” corner, Kiri’s Clown and Tinner’s Way dressed up as their famous fathers, Foolish Pleasure and Secretariat respectively, and Falcon Scott tried to convince everyone he was his (gray) Derby winning brother Giacomo. We all went along with the ruse, but…trick or treat! Even after a day of heavy rain this past week, the paddocks are still dry and dusty. Horses are still dirty too; it’s just now they have dried mud on top of the preexisting dust. With winter coats coming in thick and fuzzy, there is more hair to pack the dust and dirt into. The end result–there is not a clean horse on the farm. Today was a pretty typical tour day. We had horse people, horse novices, bus tours, local people and people from as far away as California. We had a couple of three generation groups –grandparents, grown children, and grandkids. We had a toddler named Ashlynn who loved, and fed, every horse she met. As we walked up to our first horse, (The Wicked North) and she reached her hand out of her stroller toward Norty, I knew we had a horse girl. The people on the tour who weren’t related to Ashlynn’s family but whose daughter rides, told Ashlynn’s parents to save their money–riding lessons don’t come cheap! On the 10 am tour this morning we walked only as far back as Ogygian, which meant Bull and Commentator could see us, and the carrot bucket, even though we didn’t get over to them. I felt bad, so I brought the 1 pm tour back to them. Bull was patiently waiting by his gate for treats but Tator met us with his ears pinned back. So, here is my interpretation of that message: Bull has done this tour thing for long enough that he knows we’ll eventually get to him. Tator, on the other hand, was just flat-out mad that we bypassed him in the morning and then had the nerve to visit Bull first. He wanted me to know exactly how he felt about that! But perhaps not surprisingly, after three mints and numerous carrots all was forgiven. In the end, it’s true that Commentator can be had with a handful of carrots and a couple mints. Having been a clear and cool morning, you would think the horses would be more active, but we began our day remarking on how many lazy, sleepy horses we saw. Gulch was napping, as were Norty and Clever. At one point we saw Dan curled up like a puppy in the sunshine, and Ogygian was snoozing under his tree. But never fear—Super Pops and Bat Ring thundered up the hill, letting everyone know they are on the job. Those two are such show-offs; I think Leave Seattle just rolls his eyes at them. Awad huffs and puffs—he gets jealous—and Swannie just makes sure he looks really, really cute. They all have their special ways of getting the love! horses who ran in, or won, Breeder’s Cup races. There will be a barbeque, a silent auction, some special guests, and a whole lot of fun. Details are on our website, www.oldfriendsequine.org. If you are in the area, we’d love to have you join us. In the meantime, thanks for spending this Sunday with Old Friends. Just when you think you have seen any and all possible Kentucky weather, today happens. You begin with a nice, autumn day. Toss in some sunshine. Add nearly four months with no rain to speak of, and thoroughly puree it all with a lovely gale-force wind. The result? A little dust. Dust in your eyes, dust in your nose, in your hair and in your mouth. Dust all throughout your clothes. Just, dust. There is no grass to speak of in any of the paddocks, so the horses are getting hay along with their regular grain. It seems early in the fall to be feeding hay, and the big, multi-horse paddocks have large round hay bales in place. Gulch, who normally won’t walk farther than 10 or 15 feet for a carrot if there is grass to eat, is now walking clear across his paddock for treats. The horses handled today’s wind and dust in different ways. Pops and Ring hid behind their run-in shed, trying to avoid the wind. Awad stood at the corner of his paddock and neighed at anything that moved. Leave Seattle was so irritated he wouldn’t even eat carrots. He turned his back on us–carrots versus tail to the wind, and carrots lost. Commentator pinned his ears flat back and bucked along the fence line. I guess he thought we should somehow make it stop. Williamstown ate his carrots but then turned right around. The only horse who was mostly unaffected was Cherono. His paddock behind the office is in a little bit of a dip and it seemed the wind mostly blew right over top of him. Although now that I think about it, Bull didn’t seem to mind the wind either. Unlike Leave Seattle, Bull would never dream of turning down a carrot. Not wind, nor rain, nor the dark of night ever kept Bull from his treats! This morning, before the wind really got whipping, was the most pleasant part of the day. It was cool enough to wear a sweatshirt or jacket, and at that point the wind was more of a slight breeze. Fortunate Prospect actually cantered over to see us. It’s pretty amazing that at age 29 he still feels good enough to do that. He continues to grow more and more white spots in his nearly black coat. Each spot is about the size of a quarter, and along with the ever-increasing amounts of gray in his face, gives him a rather unique look. This morning’s tour just went on and on, for nearly two hours, since we had late comers joining us at several points along the way. We probably spent the majority of our time along the row that houses Kiri’s Clown, Tinner’s Way, Sunshine Forever, Falcon Scott, Free Spirit’s Joy and Marquetry. It is always fun to watch people who have never been around horses, as they start hesitantly handing out carrots, graduate to tentative pats, and eventually to kisses. Marq is a perfect horse for that, as is Spirit, since they have all the patience in the world for people who aren’t too sure of this whole horse thing. Tinner on the other hand, is not so patient. Just give him the carrots, thank you very much. We had several groups today that were made up of parents, grown children and grandkids. Usually there is one person who wanted to visit Old Friends and they drag the rest of the family along. Everyone generally ends up having fun, and I have a suspicion that inevitably the person who least wanted to visit is the one who enjoys himself the most. But still, the kids are the best visitors. We had a lot of kids today, ranging in age from toddler in diapers, to 5 or 6, all the way on up. One little guy named Jack got to the point where he just grabbed carrots from the bucket and handed them out. I don’t think I ever heard him say a word, but the horses don’t care about that anyway. And never ceases to amaze me the difference in the horses’ behavior with the kids. Every single horse took carrots as gently as can be from Jack. The horses are much more eager, or maybe determined, when adults hand them carrots. But with little hands the lips are as soft and gentle as can be. The weeks and months just fly by, don’t they? The World Equestrian Games have become a memory and Keeneland is halfway through the fall meet. Breeder’s Cup tickets arrived in the mail this week, and November is just around the corner. At Old Friends, the maple trees lining the driveway to the big barn turned blazing red last week but have already faded to a muted burgundy. Leaves are falling, early it seems, but maybe understandable in light of how dry it has been. The horses are getting fuzzier and looking almost ready for winter. Black horses are really black, red horses are deeper red, and Bull is still nearly white. Dr. Fraley was at the farm today, working on Bull’s feet. I heard him say that after nearly two years of wearing his specially designed shoes, Bull’s feet look as good and as healthy as they ever have. A visitor at the farm who’s had horses for many years muttered under his breath, “I wish we had those shoes thirty years ago.” Last week Bull got a complete makeover—mane pulled, tail de-burred. Guess who had fresh burrs tangled in his mane and forelock again today? As anyone who has ever groomed a horse knows, they just don’t appreciate our efforts to make them look pretty! A couple of women from Akindale Farm in New York, where Evening Attire resides, came to visit today. (Evening Attire, as you might be able to surmise from his name, is a son of our own late Black Tie Affair.) The ladies and I climbed into a golf cart for a trip up the hill to see Williamstown, Polish Navy and Commentator. Willie looks fantastic—he really is one of the prettiest horses you’ll ever see, with his velvety black coat and his white trim. Tator came over running and bucking, being the showoff that he is. We also headed over to meet Tinner’s Way and Marquetry. Kiri’s Clown, unlike Bull, hasn’t messed up his recent beauty treatment. He is shiny and black. On the other hand, my pal Wallenda is completely covered in dust. He is so dusty he has brown rings of dust around his eyes and behind his ears. When I pat him it raises a Pigpen-like cloud and makes me sneeze. I told him no brushing until he stands outside in a drenching downpour or gets a bath, because all brushing does is transfer that dust to me! And the other horse who has some beauty “issues” is Kudos. I went to visit with him today and was instantly repelled…by the overwhelming smell of skunk. Apparently Kudos got a little too close to the critter. He is not too pettable right now and probably won’t be, for the fore-smellable future! The best part of the day was visiting the back of the farm—seeing Hidden Lake and Cozy Miss, patting Bonapaw, Futural and Boule d’Or. Discreet Hero, Max a Million and Easy Grades all came over, curious to see who was visiting. You wouldn’t recognize EscapedfromNewYork. He looks all grown up, fat and lazy with his friend AP Slew. Even Siphonizer wandered over to check things out, although he never gets quite close enough to touch. He’s playing it safe, just in case I’m really trying to catch him. Regal Sanction, The Name’s Jimmy and the trio of Mighty Mecke, Wallace Station and Bluesthestandard all look fat, shiny, and content. It has been a pretty quiet week at Old Friends, but sometimes that is a good thing. We hope you can visit us soon, but in the meantime, thanks for stopping by! I have a quick update to yesterday’s blog entry. People ask me on nearly every tour if owners, trainers and jockeys ever visit their horses. Many of them do, and The Wicked North had a special visitor today. Kent Desormeaux, who rode Norty in many of his races, comes to visit him whenever he is in town. Now, some jockeys come to visit and some come to work. Kent clearly falls into the work category, as he gave Norty a bath today. He also hopped on board for some photos, walked Norty around the farm and generally hung out for awhile. And I can personally vouch for the fact that by the time he left, he was as wet and dirty as anyone who bathes a horse. There is no doubt Kent loves Norty. And Norty, who is normally the calmest of stallions, remembers Kent and in no time was arching his neck and prancing around like he was ready to run in next month’s Breeder’s Cup! So much has been happening in central Kentucky over the past couple of weeks. We have been inundated with visitors from all over the world for the World Equestrian Games; today at Old Friends we met people from Australia, Canada, Germany and closer to home from Colorado, Washington State, Chicago, New York and more. Keeneland opened for its Fall Meet this weekend, too. It’s been quite a whirlwind of activity all over the area. Old Friends has been very busy, as you can probably imagine. The horses have enjoyed the extra attention, not to mention the extra carrots. One result of the higher level of activity is the newer horses have had a crash course in greeting visitors. Falcon Scott worked the crowd like an old pro—cuddling up like a big teddy bear to anyone who got close. You’d be hard-pressed to find any young stallion enjoying his new life more than Falcon. He must think he won the horse lottery, and you know, maybe he did. Bonfante, who came to us a few weeks ago in heavy need of some extra groceries, loved every bit and bite of the attention and treats he received. This afternoon, a 14 year old girl became his new best friend. He literally took one look at her, laid his head right on her shoulder, and that was that. I asked her if she wanted to take him home, and dad gave me “the look.” You know…the look? The one that says, “Oh no, you are not doing this to me!” We had to go back for a second visit after the rest of the tour left. It was definitely love at first sight, for both horse and girl. Tinner’s Way, who is the kind of horse that expects admiration rather than loving, struck poses for every person who came by today. Since the movie about his dad came out Friday, plenty of folks are coming by just to meet Tinner. (Go see “Secretariat.” We loved it!) 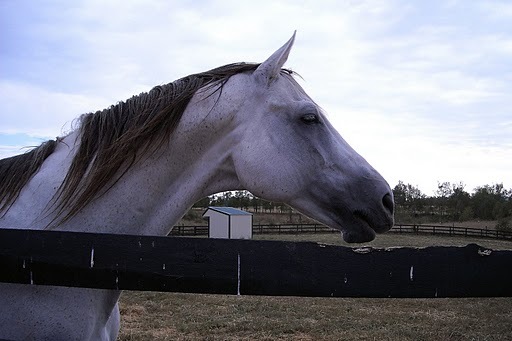 Tinner takes the attention as his due, standing by his fence with his ears pricked, gazing off into the distance with the nameplate on his halter facing the camera. He knows exactly what’s going on because I bet nearly every photo taken today clearly shows his nameplate. No photos of his “bad” side for Tinner! Another example of a horse who understands what we say: after gobbling carrots too fast and subsequently needing the horse equivalent of the Heimlich maneuver, Jade Hunter is on a treat-free regimen for the time being. At first he pouted pretty hard when he saw Gulch getting carrots. But now he has figured out how to work the sympathy vote. He strolls over to the group and waits for me to tell everyone why he can’t have treats. Then he looks all pathetic and sad, sticks his head over the fence and soaks up the love. Everyone stops feeding Gulch and turns toward Jade. He ends up with enough pats, kisses, and hugs to last him for a month, and I am pretty sure he sticks his tongue out at Gulch as we walk away. But all that is minor league, compared to this next example. I swear it is 100% true, and there are witnesses out there to back me up. Last week, someone asked me why Pops and Ring don’t have halters on. I explained that they pull them off each other, and went on to say there could be a half dozen halters hidden in the grass of their paddock. Pops listened carefully to what I was saying, turned around and jogged off to the middle of his paddock. He put his head down and came up with…a halter dangling from his mouth! And then, just in case I didn’t understand and thought it was a cosmic coincidence, he walked over and dropped the mangled Special Ring halter at my feet. All I had to do was reach down to pick it up. You will never, ever convince me he didn’t understand EXACTLY what I was saying. I still barely believe it. And really, after that, what else is there to say? We continue to offer tours every day, and we hope you can visit us soon. In the meantime, thanks for spending this Sunday with Old Friends! Since fly masks are off and winter coats are growing in earnest, it seemed like a good time for a photo blog. Courtesy of part-time tour guide, world traveler, Zenyatta fan, and wonderful photographer Laura Battle, here are some of our long time favorites, as well as some newer Old Friends. Thank you, Laura!